I love fabric and I love stitch. I love colour and how colours dance together, and I love texture and making pattern. I make wall quilts. I am enormously proud of the long tradition of women quilters and patchworkers who fashioned fabric into the soft stuff that wraps and comforts us from the moment we are born. Today those distant beginnings have transformed into a vibrant art form. I love stitch as a means of drawing on fabric and the way stitch joins things together. My early childhood memories are of the sound of a Singer treadle machine busily joining things together. Today I have a trusty Bernina, my best friend in my work room. I am a late starter and largely self-taught. Several threads of ongoing work are here on display. 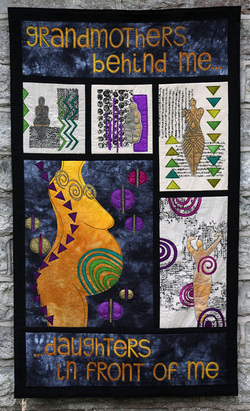 The Spirit of Womankind – a theme close to my heart. The words “Grandmothers behind me.... Daughters in front of me’ emerged out of a conversation with my daughter. I am also fascinated by the ‘spirit of seed’, that wondrous force that contains the complete and complex blueprint of a plant in its absolute simplicity – the divine in action. I also have a long love affair with the work of Gustav Klimt and his use of highly decorative symbolism – which in turn he gleaned from earlier cultures. Geometric shapes and patterns, lines and curves, vertical and horizontal, circles and squares are an ancient language that speaks direct to the soul, no words needed. Like melting into the silence of Meeting for Worship.